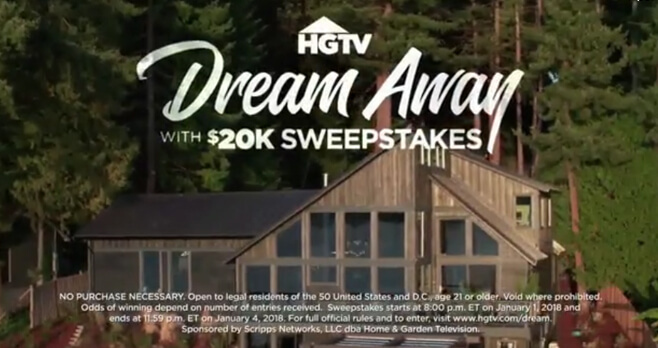 In celebration of the HGTV Dream Home 2018 Giveaway, HGTV is offering you the chance to win a $20,000 cash prize with the Dream Away With $20K Sweepstakes. Watch the HGTV Dream Home 2018 special on New Year’s Day at 8/7c, look for the special HGTV Dream Home code word “DREAMY” then, visit www.hgtv.com/dream to register for the Giveaway by January 4, 2018 for your chance to win the $20K grand prize. Who Can Enter? The HGTV Dream Away With $20K Sweepstakes is open only to legal residents of the 50 United States and D.C. (excluding Puerto Rico, Guam, the U.S. Virgin Islands and other United States territories) who are 21 years of age or older as of the Promotion start date. When To Enter? Sweepstakes begins at 8:00 p.m. ET on January 1, 2018 and ends at 11:59 p.m. ET on January 4, 2018. What Is The Dream Away With $20K Sweepstakes Prize? The Grand Prize consists of $20,000 cash (presented in the form of a check). Who Are The HGTV Sweepstakes Winners? Beginning on or about February 1, 2018, you may obtain the name of the Grand Prize Winner by going to hgtv.com/sweepstakes. I’ll be watching and dreaming away!